"Flamenco is not the steps. Flamenco is the compás." Linda Machado is a full-time working professional Flamenco & Spanish dancer with 26+ years’ experience who performs in concert halls, theaters, museums, restaurants, night clubs, schools, libraries and cultural venues throughout the Southwest and Mexico. A former member of Daniel de Córdoba Bailes Españoles dance company, Ms. Machado is the Artistic Director of Un Corazón Flamenco, a professional Flamenco performance company. Ms. Machado was introduced to Flamenco and Spanish Dance by Daniel de Córdoba who was a member of the legendary José Greco Dance Company. 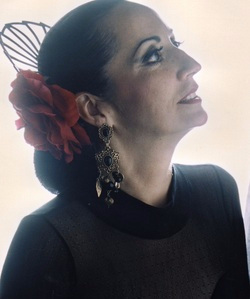 She went on to study many renowned national and international Flamenco artists including Javier de la Torre, Omayra Amaya, Antonio Hidalgo, Yaelisa, Monica Bermudez, Lydia Torea and Joaquin Enciñas.Ms. Machado spent several years as an artist with Young Audiences of Greater Dallas, conducting numerous school programs and residencies throughout Texas. She was associated with the Northeast Tarrant County Arts Council as a Flamenco instructor and is a selected Roster Artist for the Arizona Commission on the Arts. She teaches Flamenco dance and culture at Flamenco! …the Studio in Tempe which she co-owns with master Flamenco guitarist and Flamenco historian Ricardo de Cristóbal. Ms. Machado’s Flamenco dance style is infused with the passion and power of Flamenco, the grace and elegance of classical Spanish dance, and the exhilaration of improvisation – the most basic fundamental of authentic Flamenco dancing. She has the ability to execute clear, strong and rapid Flamenco zapateado while maintaining the posture and graceful arm work of a Spanish dancer. As an instructor, her patience and ability to convey simply the challenges inherent in Flamenco dance technique make it possible for her to maintain an active base of students ranging in age from 2 to 80. Ms. Machado continues to immerse herself in the art of Flamenco through research and participation in authentic living Flamenco on a daily basis. Linda Machado and guitarist/husband Ricardo de Cristóbal (Un Corazón Flamenco) are the only Flamenco artists in the State of Arizona endorsed by the Arizona Commission on the Arts* to teach and present Flamenco in both the Community and Educational tracks. Linda Machado is a published author on multicultural education with the Teaching Artist Journal, is a regular contributor to DanceUS.org and has taught virtual Flamenco dance and culture to elementary school students as far away as Africa, the Middle East and China independently and through Arizona Virtual Academy and K-12. She holds a Level 1 Fingerprint Clearance Card with the Arizona Department of Public Safety. Linda Machado is Ms. Senior Rhode Island 2014, Top-Ten Finalist Ms Senior America 2014, Ms. Sr. Arizona 2012 Talent Competition Winner (for Flamenco dance) and holds 2nd place for the title of Ms. Sr. Arizona 2012 and 2013. "My class is made up of a large number of students with academic and emotional disabilities. Ms. Machado was not aware of this. It was heartwarming to watch how easily she interacted with them. The special needs students were able to participate and learn about Spanish culture through her direction, patience and love for what she does." "This program effectively supports existing curricular studies, presents cultural perspectives, meets state Art and/or Academic Standards, deepens understanding of the art form, engages participants interactively, provides models for continued use of the art form in classrtoom curricula and met the description and goals as defined in pre-planning. Ms. Machado was an excellent instructor." "The children really enjoyed learning about Flamenco and, of course, performing. That is all they kept talking about all week." "This was such a wonderful program for myself & my students. The parents loved it too."